Make sure that all the conditions for environment, subfloor and materials are met before attempting to install the medallion. 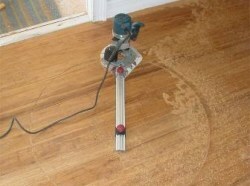 If installing in glue-down parquet allow at least 24 hr before installing the medallion. Note: Prior to installation, keep the medallion in the climate controlled environment, flat, in horizontal position to avoid possible warping. Acclimate the medallion for at least 24 hr. in the room where it will be installed. Keep the medallion in the original plastic wrap prior to installation. Humidity and Winter season warning: Please keep the humidity level in the house within acceptable range of 40 to 60%. Dry in-house air is typical for a cold season. This is the primary cause for wood warping, gaps and cracking in the inlays and is not covered by warranty. Use either HVAC build-in or portable humidifier to maintain the environment. Inlay are more sensitive to the moisture fluctuations than regular plank hardwood floors due to the combination of different wood species with different hygroscopic properties. There are two methods of installation - Pivot method and Template method. Pivot method works great for round medallions of any size. The pivot arm can be purchased or can be made out of piece of plywood. The idea is to secure pivot nail or screw in the center of the place where medallion to be installed. 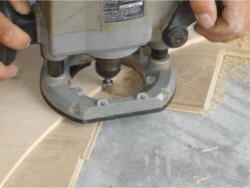 The arm with the router must be circled around the pivot center to cut through the floor. Drop the router 1/4" at a time. Make sure the outer edge of the router bit does not extend beyond the size of the medallion. 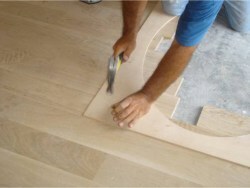 With this method the floor is cut by using template as a guide. The router bit has a guiding ball bearing on top of the cutting edge. The cut in the single pass should not exceed 1/4" depth to avoid damaging the bit. The hole should be cleaned and vacuumed. The medallion can be dry-fit to check the accuracy of the cut. The next step after cutting the floor is glue down the medallion into the opening. The medallion can be weighted overnight to insure good adhesion.